Some time ago, while taking a walk in a natural setting, I was seized by an irrational impulse — Poe would call it the “Imp of the Perverse” — to rid myself of my iPhone by hurling into a creek, or dropping it into a clear pool, and watching to see how long it would take for those glittering gem-like app icons to wink out of existence. Like most healthy people, I have a love-hate relationship with technology, and I wish humanity would make greater attempts to question its utility. The romantic movement was a reaction against industrialization; I hope a new and similar movement will someday take hold in our digital age. There needs to be a backlash on technology’s dominance over our lives and a rediscovery of what it means to be human. Anyway, this was a poetic attempt on this theme. I don’t know what I’m doing, but I do enjoy the idea of using traditional poetry to address modern subjects. Thanks for visiting! 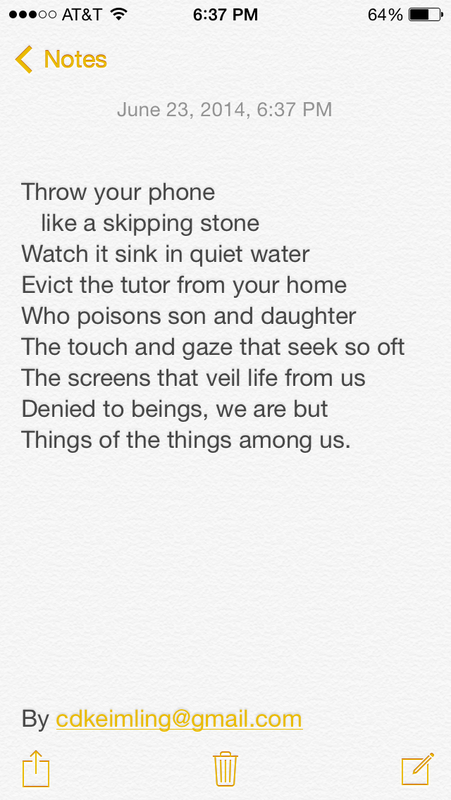 This entry was posted in My Own Poetic Attempts, Uncategorized and tagged poem about technology. Bookmark the permalink.